I can't really explain exactly why I haven't taken any personal photos with my "good" camera for so long. More than a year in fact. Most of my friends in the photography world will know that this is something I have battled with for so long - the guilt of not capturing my family despite having the tools and know-how to. I see so many in the photography world photographing their everyday so wonderfully and authentically, and while I have a deep appreciation for it, I just stopped feeling the need and urge to do the same. I photograph 2-3 clients a week, and I am so fortunate to have clients that trust me to just "do what I do" and let me have free creative reign. I get so much satisfaction from my client work and I am lucky that it also provides a creative outlet for me to constantly explore and expand, while continuing to have happy clients who love what I am creating for them, and I'm able to making a living while I'm at it. To be in that position is every creative's dream! 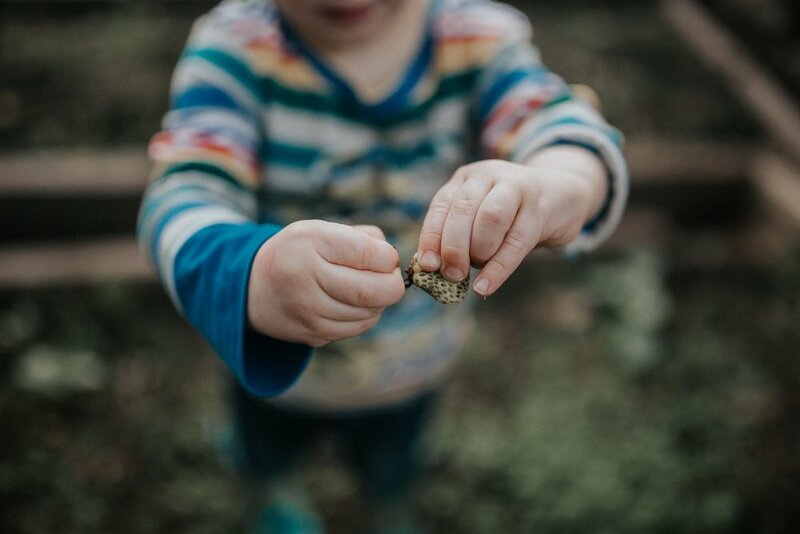 Recently I had a 1:1 session with my guru and mentor Yan Palmer, and she gave me permission to stop feeling guilty about not photographing my family, and to just be present and enjoy them in the moment. It was completely ok for me to leave my camera at my desk and only take it out for client work. She reminded me that we all need a break to ensure our creativity stays alive, and shooting 2-3 sessions a week meant I needed the down time in between shoots to stay fresh. It was completely okay. Phew. One less thing I had to feel guilty about! But last night something magical happened. 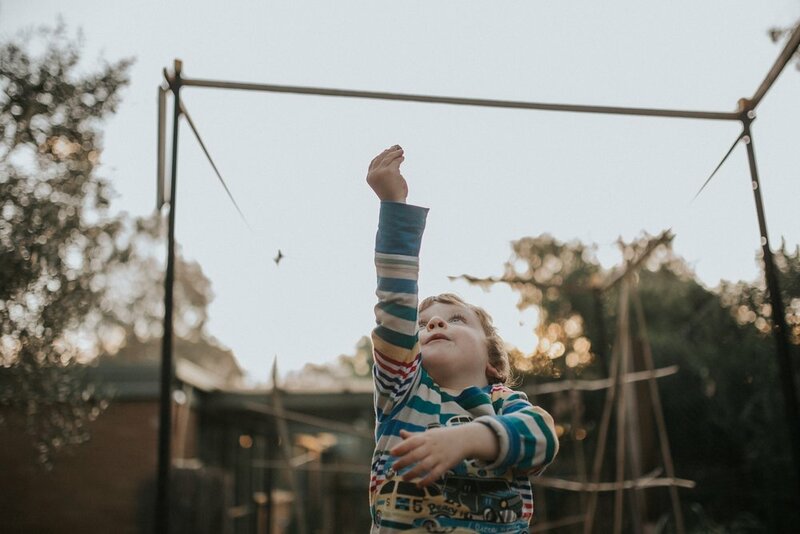 I watched my bearded love building our kids' trampoline in our new backyard while my sweet Archie danced around the yard with carefree abandon, filling the air with laughter and songs. 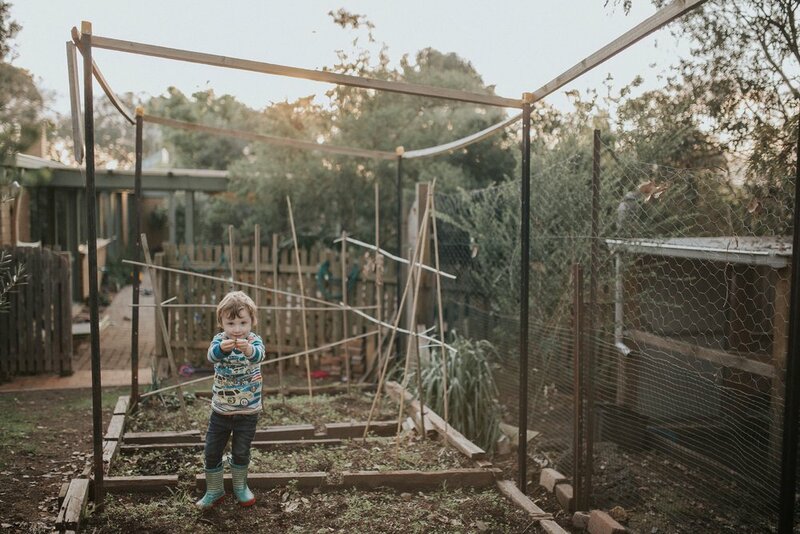 The sun was slowly sinking and lit up our veggie patch and chicken pen (which we are yet to fill). In a week that has been a pretty hard one, it was a magic, happy moment. I felt so full and content. The urge grabbed me and I ran inside for my camera - an urge that I haven't felt in the longest time. A combination of the light, the sounds, the people and our new home and I was filled with inspiration to capture it. These images mean so much.